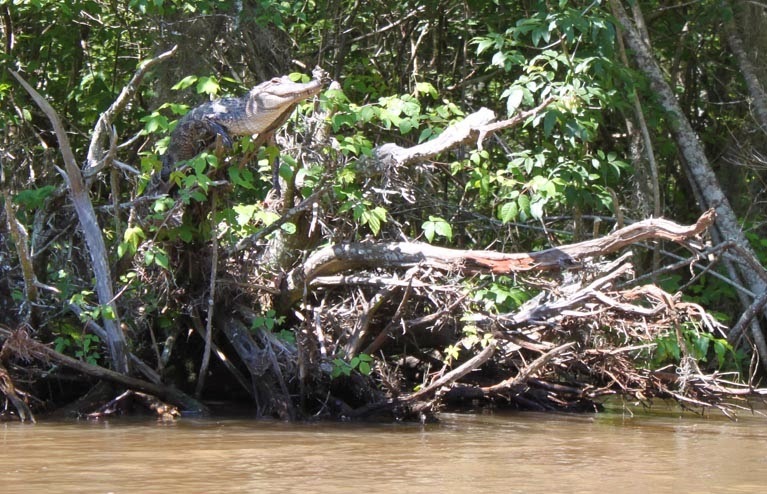 Croc Blog: Can crocodiles really climb trees? 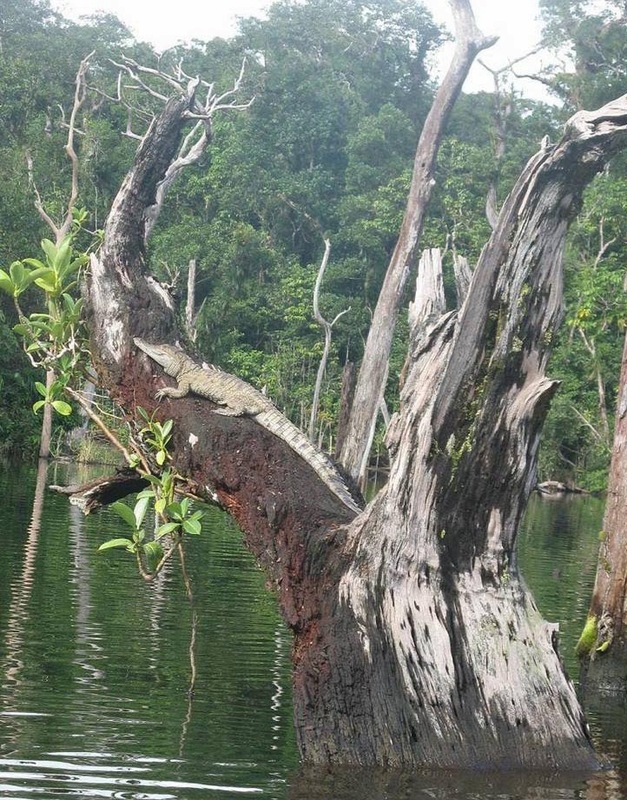 Can crocodiles really climb trees? Vladimir Dinets, Matt Shirley and I recently published a paper entitled "Climbing behaviour in extant crocodilians". Here's a link if you'd like to read it. The resulting news stories have been quite extensive, to say the least! Everyone is fascinated by the idea that crocodiles, those vicious man-eating predators we keep hearing about, could climb trees. Perhaps it means that climbing a tree to escape a crocodile is no longer an option? Perhaps it means that crocodiles will start dropping from the branches onto your head for a surprise dinner date? Perhaps when you see a fallen tree by the river bank, you'll think "Wow, it must have been a heavy crocodile to bring that one down!" Of course I'm just having a bit of fun. None of those possibilities are true, you'll be pleased to hear. Actually, it's been known for a long time that crocodilians (or crocodylians if you want to be pedantic) can climb out of the water onto floating logs and low branches. We didn't publish a paper to point this out, but rather we wanted to explore how widespread this was, and look into the reasons why crocodiles might do this, and even allow us to speculate on how extinct crocodyliforms may have behaved. After all, if you look at a modern crocodile and think there's no way it could climb a tree, you're not going to assume a fossil crocodyliform with a similar morphology is going to be able to do it either. Well, here's a cool thing, some modern species can climb trees, and they can do so remarkably well, often getting several metres off the ground up relatively steep trunks and branches. The modern crocodilian limb is more adaptable than you might have thought. Why would they do this? Well, crocodilians frequently need to bask out of the water, and in areas where basking sites are limited (or where there's competition from other crocodilians), you have to make do with what you can. If you can climb it, why not use it? Getting above the water also gives you a better view of your surroundings, better to see potential threats, whether they be predators, other crocodiles, or curious fishermen in boats. Escaping to safety is an easy as falling off a log (ok, I admit it, I love that). We might be seeing an increase in climbing behaviour if crocodile populations are recovering and competition for basking sites rises. Changes in habitat can also alter behaviour. The point is, crocodilians are agile enough to climb up steep banks and tree branches if the need arises, they're better at it than you might have thought, and anything that makes us appreciate crocodilians a little more has to be a good thing. One criticism I've read about the work is that crocodiles aren't really climbing trees, what they're doing is being lifted by the tide, settling in a branch, and then staying elevated as the tide falls back. I'm sure this happens quite often. However, crocodilians can be found in trees several metres above the water in non-tidal areas as well; assuming they haven't learned to fly or teleport, they must have climbed to get up there. We've seen this behaviour, I've even put small saltwater and freshwater crocodiles into branches and seen them clamber around quite successfully. You aren't going to find many 5 metre long crocodiles sitting in trees though, they're simply too heavy, and their limbs are not strong enough proportional to their body mass to lift them up. Larger crocodilians are much more likely to use tide where it's available to help them move around, not because they're lazy, but because they like to save energy. Another possible explanation for crocodiles in trees? 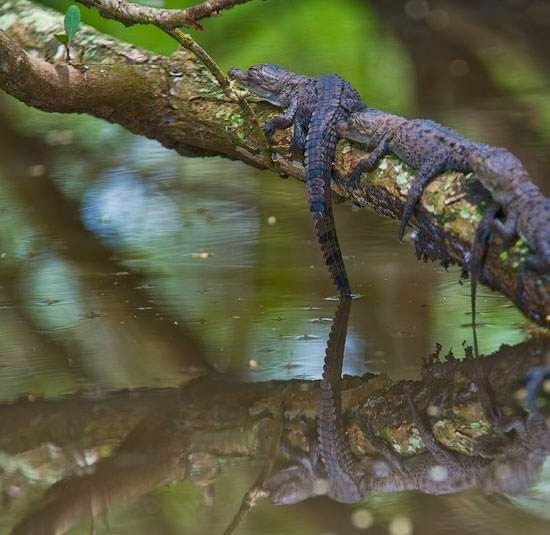 Still, next time you see a crocodile or an alligator sitting in a tree, even if it's a low branch or floating log, consider it as a glimpse back in time to an age where long-extinct species once hunted for their prey over land and up into the trees. If you think that was unlikely, look at Mekosuchus, a group that may have occupied an ecological niche similar to modern day goannas, and therefore considered by some to have been capable of climbing trees quite easily, perhaps to raid bird nests, perhaps to escape from predators, and perhaps just to find a nice, safe, comfortable spot to bask. Hello Dr. Britton..I was wondering if you and anyone else reading your blog could recommend a one crocodile documentaries and possibly provide a link where I can find them..I would greatly appreciate it. I always thought of crocodilian limbs as relatively unspecialized and able to fulfill a number of functions, so the idea of small individuals being able to climb trees isn't really surprising. One question though. Can crocodilians pronate and supinate their forelimbs?